As some of you know, 2013 wasnt a good year for my family and I. It was the year from hell to be honest. 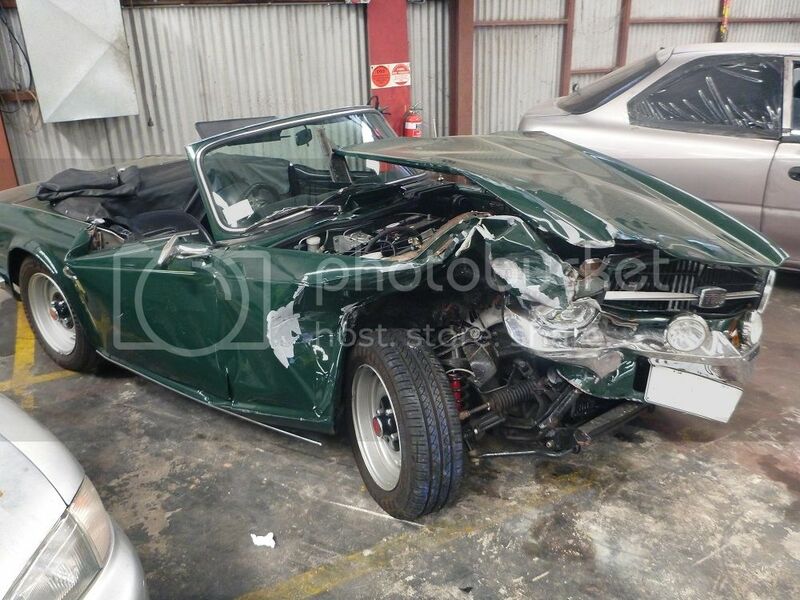 During the 'annus crapillus' unfortunately my TR6 was written off for me by some a$$hole in a Holden Monaro in a hurry to get to his therapy (I assume or was it his Im a bogan get out of my way class?) by running me off the road. I wont share the pics of my face..but needless to say a few operations were required after using my face as an airbag. Anyway..2014..new year and all that jazz and with the Australian weather cooling a bit, means I can finally get on with resurrecting the '6'. I`ll say from the outset that Im not looking to build a concours, neither am I after building a modified race car with all the go faster bits. It WILL be built to a budget, but to a high standard (Im an engineer..we are born with this OCD type of detail in our DNA). I have to to make it financially viable for a 39 (nearly 40!) year old bloke, with 2 kids a mortgage, dog, cat, fish and whoever else is dipping in my pocket...Oh and the other mistress (the Jensen Interceptor!). Given my day job, evening job, house etc..my ambitious estimate is a 3 year rebuild..It may be sooner..may be later but at no point am I/can I let it take over. The whole point of this hobby is to enjoy it after all. More on what the plan of attack with this in a few months hopefully. There is not a hint of rust! Next jobs are to gradually expose the engine so it can be removed from the shell. Glad your back on track Andrew. You know where we are when the difficult bits crop up. Good luck. Cars Owned::Current Transports<br /> <br /> 1974 TR6 mongrel.....<br /> Alpina D4 Biturbo<br /> Ducati Panigale 959<br /> Ducati Hypermotard 1100<br /> Honda CB360 based Cafe Racer<br /> Amita, x-yachts X-46<br /> Marin Mount Vision and Paratrooper Pro mountain bikes. We're all looking forward to seeing your progress and eventual return to the road. Yes Good Luck Andrew, all the very best. Best of luck, see? it's impossible to keep a good man down! Best of luck with it and Best Wishes also! There's no rush me old (young) mate, it's gonna be a beauty when it's finished. 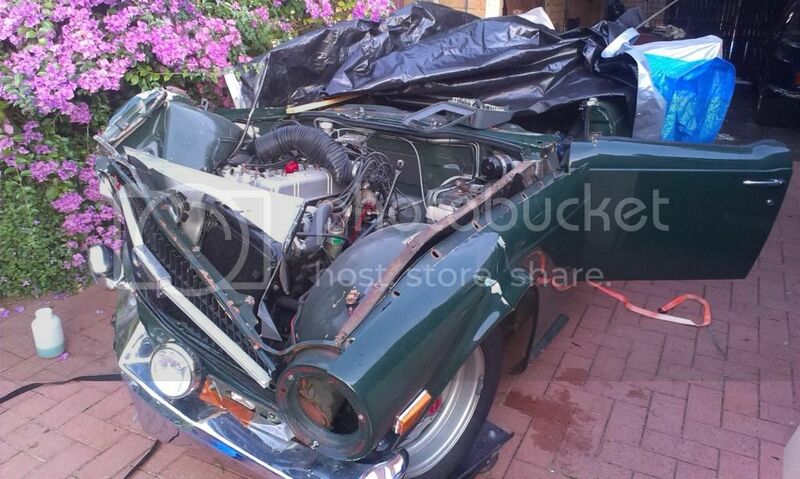 Andrew, we were all pretty devastated by what happened, felt bad for the TR6, very concerned about you. Glad to see you are back on track and we will be here to help. Location:Farnham, Surrey (uphill from Baldrick) - but West London born and bred! Glad your'e feel able to make a start on with the restoration, but I must ask (probably covered in your initial thread) - why is the insurance not covering the cost and commissioning the work? Good luck with the rebirth. Thanks for the kind word folks..
Andrew, the insurance paid up, wrote the car off and gave me the car back. 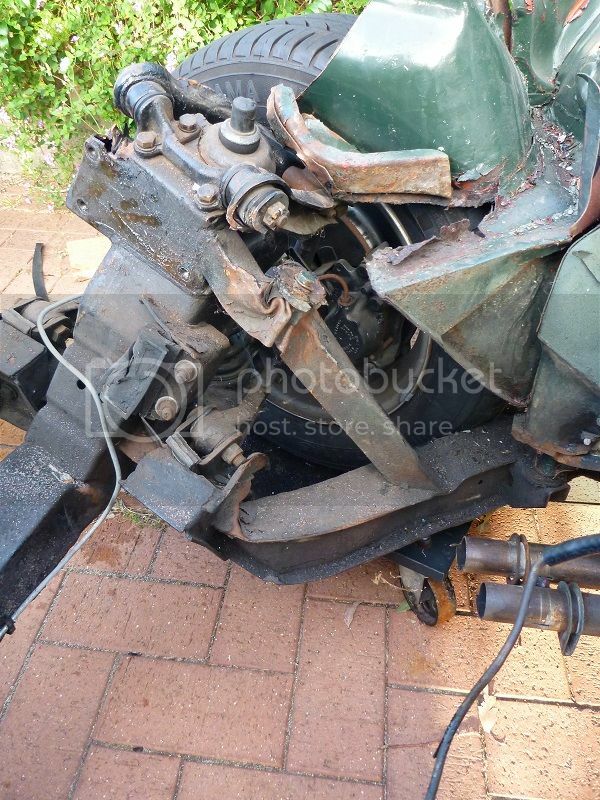 Post accident, and sitting down with my wife, it became very apparent that I was bloody lucky not to flip the car. 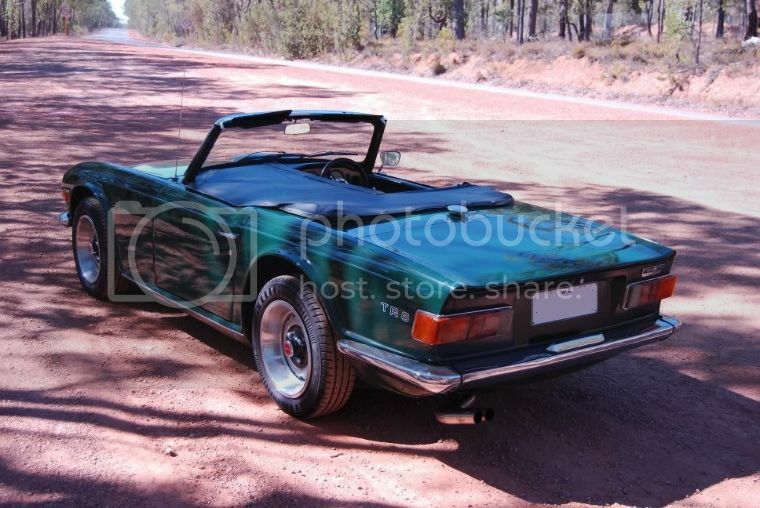 Being 6ft 5", a roll cage and my lump just doesnt all fit into the TR and so it was agreed that the 'next' car would have a roof (or at least protection) and have 4 seats so I can include my family in this crazy hobby....and so the Jensen was purchased with the insurance money. For a few months now, the Jensen has been the centre of my attentions (when i get time) to ensure it stops, starts, goes etc with minimum of fuss. Its taken a lot longer to sort out the old girl to a reasonable level but the Jensen really is an amazing car to drive and be in and she is now luurrrvely and burbles along quite happily if needs be...but plant your right foot and you soon realise that you have 6.3 litres under the bonnet (in fuel consumption as well as speed!). Talk about different ends of the spectrum though as far as car ownership goes. I cant seem to scratch that TR itch though (perhaps Im missing the seat-of-pants style of the '6'), and little by little I've (with help from mates etc) been chipping away and getting everything sorted so as to make a decent run at restoring the TR. I miss its 'honest little battler' style if I had to put it into words and it makes me want to see it back on the road. Even more so when I see it on my drive under the covers. So...when time allows I`ll strip the old one down (no time today ) and get on with it. Time has been hard to come by recently. Admittedly, its been winter and there has been a fair bit of 'hibernation' (aka get home, drink wine and fall asleep on the sofa), but Ive also been fixing up and getting the air-con on the Jensen up and running. But..today I had a hour spare, so I threw back the tarp and started where I left off last time. To fill in a slight gap from the above photos..I had a whole day a few months back and we persuaded (understatement!) the engine and gearbox to part ways with the car. As you can see from the below photo, the chassis 'aint that straight and getting the bell housing past the kink in the chassis leg proved very difficult and needed more than a fair share of heaving, prying and wiggling to get it over and past the bent chassis. Remember on a straight chassis these rails/legs run parallel down the car, and so the motor can slide out the front normally! 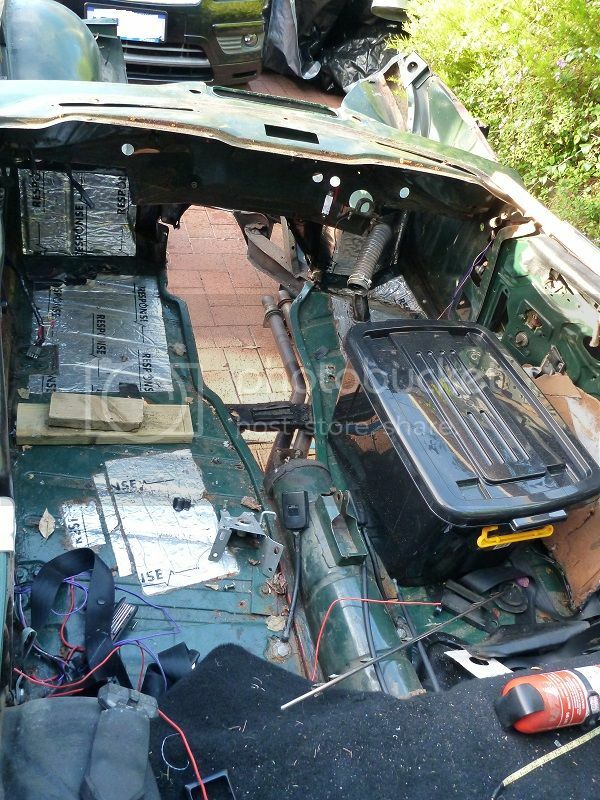 Anyway..I basically completed the front and cabin strip down, boxing all the fittings, screws etc as I went, so Im pretty much 'there' as far as the front 2/3'ds of the car go. I was keen to remove the rear wings and get them stored and up in the loft before they were damaged due to one of my kids bikes or whatever hitting them. They are nice and straight, not a hint of rust and original, so Id like to keep them that way! All I have to do now is to remove the fuel tank, PI pump, filter and PRV and I can begin to free-off the body tub and get it separated. The replacement front suspension is almost ready to go, so as soon as I can remove the tub, I can begin to build up the replacement chassis to get it rolling. the House is now a HOME.......Get in!!!!! 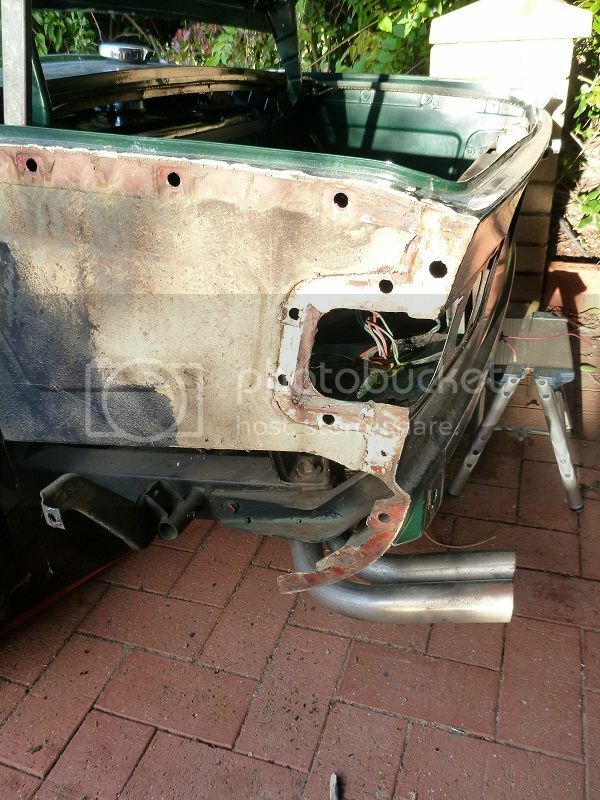 Some major work ahead getting the tub sorted, but I'm looking forward to getting the rolling chassis sorted and 'done' in the next few weeks. Over the last few evenings Ive been removing parts from the old bent chassis and simply putting them back onto the new chassis. During my ownership I have gone through most parts and overhauled them, painted, replaced etc therefore a brief check that the parts are all still OK to use and the plan is to simply refit them (maybe give them a wipe down with a rag!). I should add that anything associated with the accident damaged front side is not being used. Ive just been reading Edwins TR2 rebuild http://www.tr-register.co.uk/forums/index.php?/topic/42421-rebuilding-my-tr2-after-accident/page-3&do=findComment&comment=345218 (us accident folk stick together ) and I can see that he fixed up his body tub on a bare chassis (no suspension etc fitted). 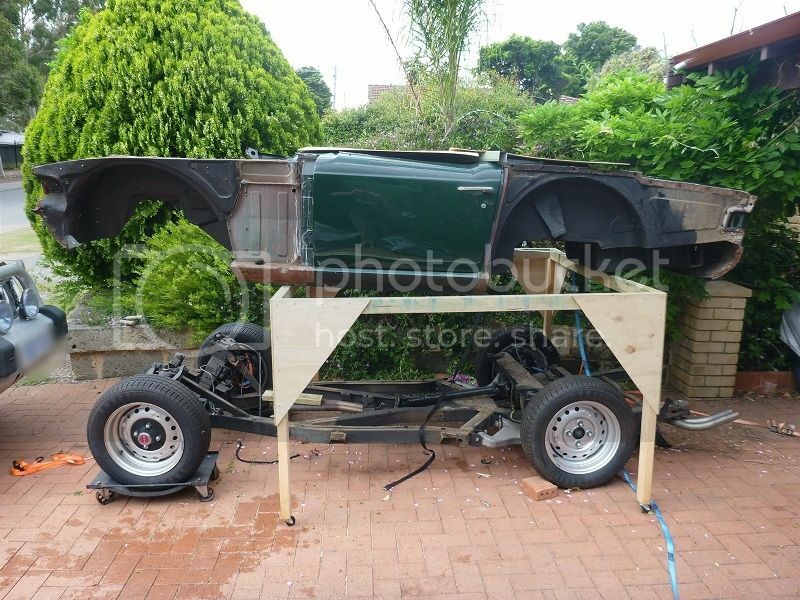 Before I go too far and get the new chassis 'rolling' by moving the suspension, roll bar, trailing arms etc etc all over from the old chassis is it better to leave as much as possible off and get the body sorted first on the new chassis? 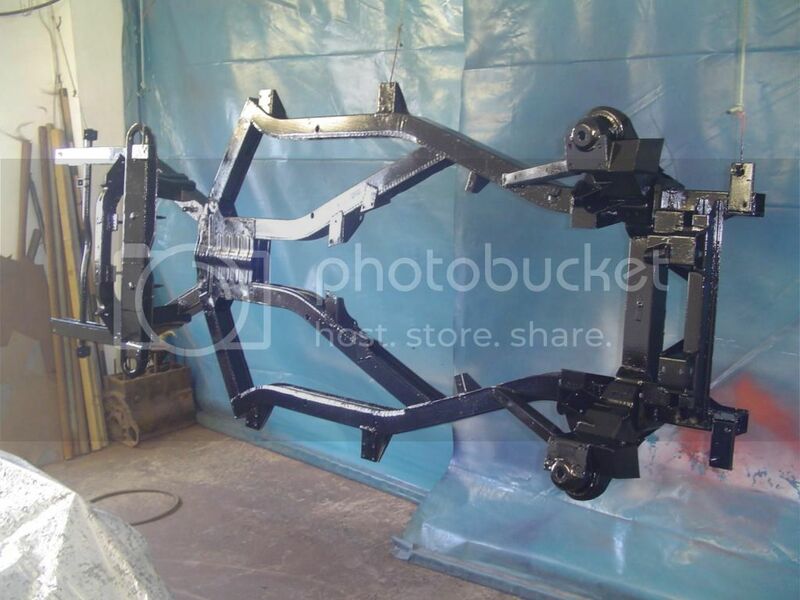 I had a thought that all the cutting, welding, tacking etc Im going to need to do could potentially damage the nice new chassis and even possibly the suspension components etc. Saying that however I know its very possible to repair the tub with it sitting on a fully built up car..
Any thoughts? as whilst the rear trailing arms are on the new chassis...its not a big job to remove them and concentrate on the body tub. The perceived wisdom what I have gleaned over the years of restoring TR,s is to fully load up the chassis and build the body shell on it.This includes the engine/ gearbox and all running gear.I built up the body completely using self tappers and viewed it from all angles then adjusted when right.I tack welded most panels lightly and made up a jig which I bolted to the shell before lifting.Removed all outer panels.Lifted the body and put it on a braced wooden buck.Then did all the welding. Linished off and refitted to the chassis.Built up all outer panels to make sure it still fitted.Then off to the paint shop.It was a lot more involved than that but I got there.I can send photos of my restoration if it helps you, just PM me your email address. You are fortunate that Tony is near you to lend a guiding hand.Really glad it has not put you off TR,s and you are mended health wise. Good luck in your restoration. Its far easier to do all the shell repairs on a bare chassis and then it wont matter if you get primer on it or spray grinding dust etc on it. 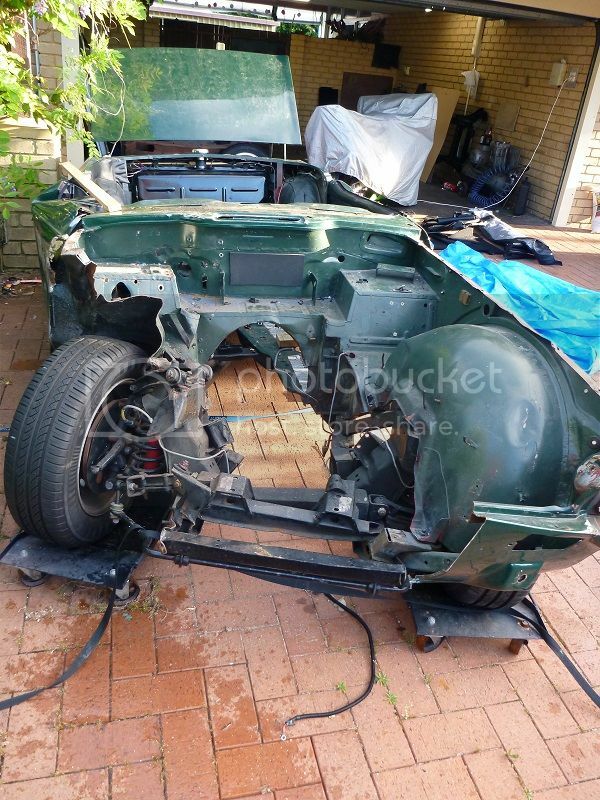 Once you are happy that the shell is solid then remove it to do the underneath welding, then fit it back to the chassis and build up all the panels and gap/repair them then you can strip it all down and paint not only the shell and outer panels but also the chassis in its final topcoat as well. Seems most ways are possible then. I may do a hybrid, that is have the chassis roll-able (i.e suspension fitted) as I will need to be able to move it from time to time and 'stack' the chassis and bodies as I mix and match the good bits from both. 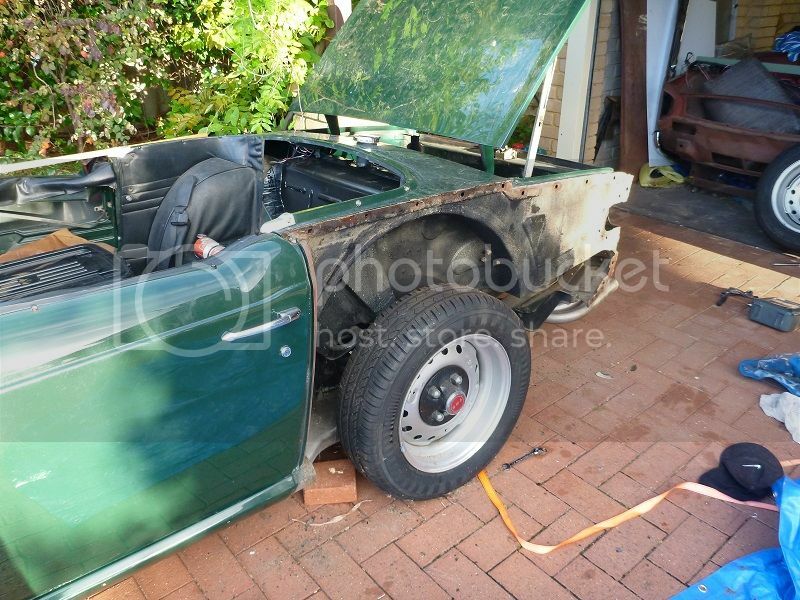 Once the tub is sorted I`ll then as Stuart says, final coat the chassis and paint the tub. Another question if I may....is it better to replace whole panels or parts of panels? The drivers side floor is buckled and bent up near the bulk head, along with the sill. What it has done though is bend upwards almost at a point. That is running from the rear, its nice and straight, then 1-2" before the A post its folded upright. Almost as if someone had folded the car in two at that very point. 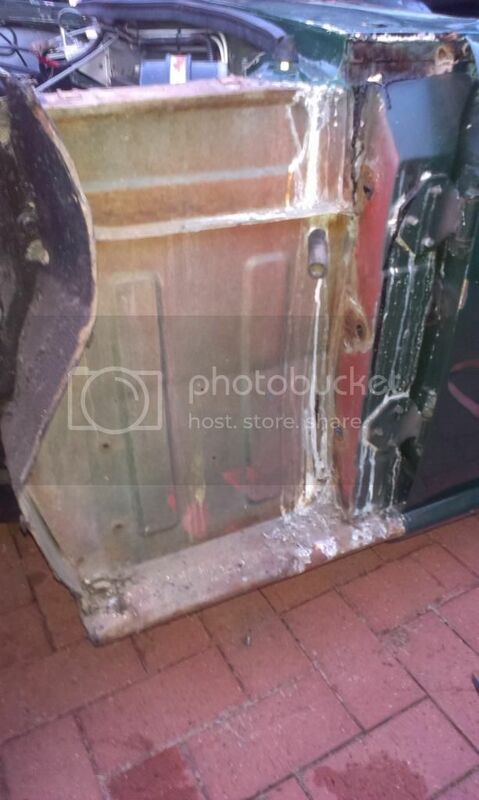 So, do I cut and replace the parts that are bent and weld them onto the old-good parts, or unpick the whole floor panel, the inner and outer sills and replace the whole panel? I know a pic says a thousand words so I may see what photos I have taken to illustrate my question better.